Icebreakers re warm-up activities that excite, engage, and jump start participants at the very beginning of our day. By inspiring and insuring fun and laughter immediately, we create a comfortable and connected learning experience. Icebreakers increase motivation, participation, and success. Sign-up for our Newsletter and receive our Free Pocket Guide outlining some of our favorite activities. Here is a glance of what is being covered. In this balancing act, it is up to everyone to keep up. Careful though…one wrong move could force everyone to start over! Switcheroo-type of game where communication is key. This way, you can literally get everyone on the same page. 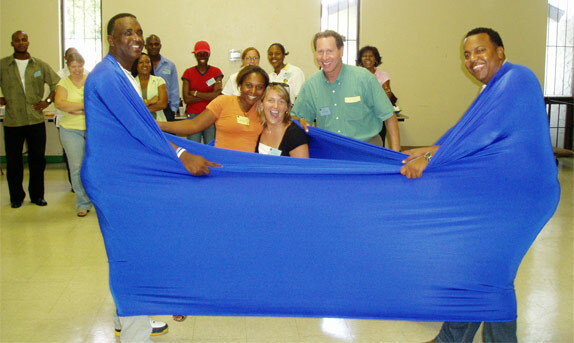 Sure it’s a “tight fit”, but it’s a great way to get your team members to bounce off of each other – figuratively and literally. A great way to boost energy after lunchtime! Your team members may get confused, and they will probably get a little dizzy. As long as they pay attention and have a good memory, they should be just fine. This game leaves the answers up to the participants, as they look to find something in common. The quirkier the fact, the better! Prepare to run the gauntlet of the human zipper! It’s not as ominous as it sounds, but you have to be alert for this one. Pick a card, any card. This particular game actually tests how we may look at people every day, whether we know it or not. A variant of a popular team building exercise involving index cards, on which character traits are printed. Visual version of the “Telephone Game”, where information is passed – and altered – from one person to another. Here, people’s drawing skills are put to the test.